Some weeks, writing this column is easy. All it takes is for an influential person – a politician, a business person, perhaps even a fellow columnist – to say something dumb and I get to spend a thousand words or so explaining precisely why they’re wrong. The “why x is wrong about y” construction is the columnist’s best friend: it’s as old as the hills and even easier to build a house on. Some weeks though, it’s even easier than that. Someone will say something so breathtakingly wrong – so tracheotomy-cravingly moronic – that I don’t need to explain anything. Simply quoting their words back at them is sufficient to make the point. Those words could stand alone as a monument to Wales’ wrongness – a warning for future generations on why we must never heed the advice of a man who calls himself ‘Jimbo’. But the very fact that Wales was invited to opine about the future of news at a major conference despite having no identifiable qualifications to do so compels me to elaborate. If people take his opinion on newspapers seriously enough to ask him to speak on the subject then there’s a terrifying possibility that they’ll take him seriously enough to act on his advice. And who could blame them? Newspaper owners are terrified – destroyed by madness, starving hysterical naked – and desperately seeking any advice on how to cauterize their bottom line. The cause of their madness is, of course, the Internet and so it’s logical – after a fashion – that they should turn to Wales for answers. After all, he’s The Man From The Internet: surely he has all the answers? For the benefit of those poor befuddled newspapermen, let’s take a few minutes – and a thousand words or so – to break down all the reasons why you shouldn’t listen to Jimmy Wales when he tells you how to run a newspaper. For a start, let’s consider what Wales actually does for a living. Or rather what he doesn’t do. He doesn’t own, operate or edit a newspaper. He doesn’t employ any journalists, has never sold an advertisement and he doesn’t have a single customer who pays to read the content he relies on volunteers to produce. For those reasons, his lack of understanding of the “added value” that high profile personalities bring to newspapers is understandable – forgivable even. Or at least it would be were it not for the fact that Wikipedia uses Wales’ own high profile personality to encourage its users to donate money in order to ensure its survival. “A message from Jimmy Wales” reads the banner at the top of Wikipedia entries during the site’s regular donation drives. These banners link to a personal appeal for support, written by Jimbo and complete with an above-the-fold photo of his face. 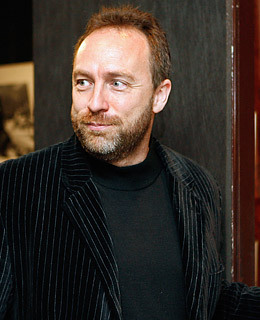 Jimmy Wales is the first encyclopedia editor since Alain T. Britannica to build a cult of personality around the gig. Why? Because he knows that personality creates familiarity, which in turn creates loyalty, which in turn creates value. Except, apparently, when it comes to newspapers. Which takes us to the real nub of Jimmy Wales’ wrongness. No one would argue that the newspaper industry – in print form – is screwed. Speaking at the same Guardian conference, media commentator and Murdoch fanboy Michael Wolff summed the situation up nicely when he said “Every big-city newspaper in the U.S. is either in bankruptcy or will be in bankruptcy in the foreseeable future – that’s 12 months. The newspaper industry in the U.S. is over”. The future of news is online, but that future brings with it the total commoditisation of facts and the death of straight reporting as a way to drive reader loyalty. Newspapers aren’t just competing with other newspapers, but also with Twitter and Facebook and blogs and thousands of other channels through which facts can be disseminated. If one paper puts its news behind a pay wall, the chances are that same news will be available elsewhere for free. Even with high quality investigative reporting, if the story is big enough then someone will simply rewrite it – perfectly legally – and post it on a blog, where it will then be reblogged and retweeted and aggregated. (The aggregators themselves encourage this: Gabe Rivera told me recently that the best way for a blogger to get content on Techmeme is to paraphrase something that previously appeared behind a pay-wall). The battle to force people to pay for general news, then, is lost. Likewise, thanks to micro-aggregators like Techmeme and macro-aggregators like Google News, the fight to maintain reader loyalty through news reporting is finished too. Sure, some people may still cling to the BBC or the New York Times out of habit, but the trend towards decentralisation – with readers choosing their news source on a story-by-story basis – is inexorable. There remains, however, one reason to remain loyal to a single newspaper – or at least to visit that newspaper’s online edition every day. And that’s for its editorial voice: the unique tone with which a publication interprets the basic facts of a news story and helps us form an opinion on it. Which, of course, is where columnists come in. Columnists – and other opinion-driven journalists – are the heart and soul of a news organisation: they’re what makes us tune in to Fox News (Glenn Beck, Bill O’Reilly) or MSNBC (Keith Olbermann). They’re why we buy the Wall Street Journal (Peggy Noonan) or The New York Times (Maureen Dowd). Newspapers know this of course, which is why when Murdoch desperately (and misguidedly) wanted to protect hard-copy sales of his flagship UK tabloid, The Sun, he removed his big name columnists from the web and confined them to print. Wales may claim that the best political bloggers are better than their mainstream rivals but he’s wrong about that too. For a start, professional columnists carry with them the weight of their entire publication. Maureen Dowd’s opinion pieces are so powerful because they are packed with insight and fact, much of which stems from the access she enjoys as an internationally recognised columnist. The vast majority of independent political bloggers can only dream of that kind of access and are instead forced to rely on second-hand reporting for the basis of their writing. But even if a political blogger does manage to deliver the goods, it’s only a matter of time before they’re snapped up by the mainstream media. I don’t care what crap they spout while they’re struggling to make it, every political blogger in the world would kill their own puppy to write for a nationally – or internationally – recognised publication. The first thing Nate Silver did when FiveThirtyEight went stellar? Take a gig at the New Republic. This symbiosis – columnistists clamouring to write for newspapers, and newspapers needing great columnists to define their voice – is where the real key to the survival of newspapers lies. Rival papers, and bloggers and Twitterers may summarise and rewrite your news scoops, depriving you of readers, but they can’t do the same with your columnists. Personality is simply not reproducible – there’s only one Maureen Dowd and there will only ever be one Glenn Beck (inshallah) so if readers want to hear what they have to say, they have to go to the source. Moreover, while news ages rapidly, opinion doesn’t. A story published online by the New York Times is dated the moment it appears and people begin tweeting out the key facts, but a well-crafted opinion column has an infinite shelf life. For all of these reasons, only the most imbecilicly terrified newspaper editor would heed Jimmy Wales’ advice and fire their most valuable assets. For all the others, there’s actually a compelling argument to do precisely the opposite. It’s comment and opinion, not news, that really adds value to newspapers in the Internet age – and as such the really smart editors will get rid of all their costly reporters and use the money instead to fill their pages with nothing but highly paid opinion columnists. Only then can newspapers be assured of their survival. I know it sounds scary, newspaper owners, but you’ll just have to trust me on this one. After all, I’m The Man From The Internet and I have all the answers.